Scientific communication is usually aimed at the audience of the very institutions that produce science. Here we analyse the experience of the Uruguayan node of the Anilla Cultural Latinoamérica-Europa, a network of co-creation, collaboration and participation that links together cultural centres in Latin America and Europe, and its relationship with the CERN. This relationship began with virtual visits but has also included visits in person, offering a case where the Internet, enthusiasm and emotion cut down the distance between people and state-of-the-art research into particle physics. Traditionally scientific communication has been aimed at the audience of the very institutions that produce science, or focused on attracting future scientists. Four years ago, it was quite strange for a scientific centre to have implemented a policy of dissemination and openness towards all people in the world, taking advantage of access via Internet in real time. 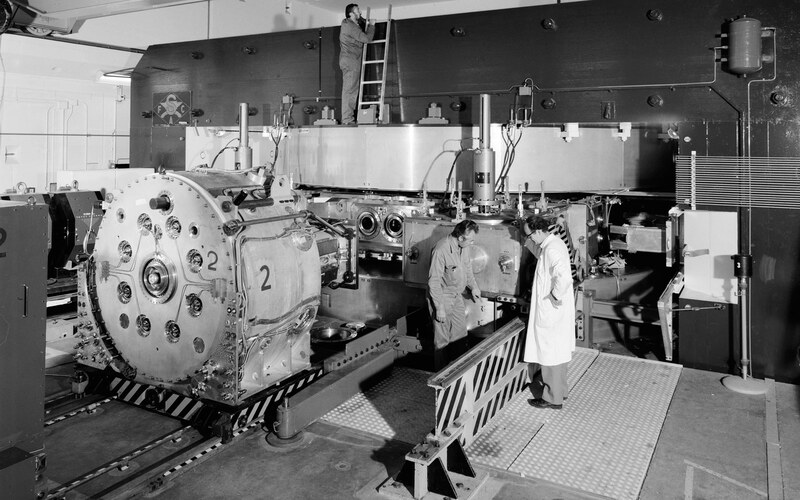 This is the case of the CERN, or European Centre for Nuclear Research, the leading experimental physics laboratory that was founded in 1954 by 12 European countries. Since its foundation, it has always had nurtured a policy of openness with regard to scientific knowledge. Located in Geneva, its research is characterised by collaboration between scientists and engineers on a global level with the aim of understanding the more profound components of the matter that makes up the universe. The centre has a circuit of particle colliders and detectors installed 100 meters below ground, in a subterranean space know as the ATLAS Room or ‘the cavern’. In 2013, the Anilla Cultural Latinoamérica-Europa organised a connection with the CERN’s ATLAS Room during the event programme for Kosmopolis. The Amplified Literature Fest. The Uruguayan node of the Anilla Cultural participated in the online event and expressed to the CCCB its interest in expanding its visits to its local audience. The first virtual visit, dubbed “Uruguay visits the CERN” was rolled out across networks all around the country, with the participation of 670 people including children, young people and adults. That first visit led to further connections and subsequent developments. For example, in 2015, the online cycle on neutrinos was designed. Participating live together with the CERN were observatories such as IceCube from the Antarctic, Auger in Mendoza and Angra Neutrino Project Brazil, among others. 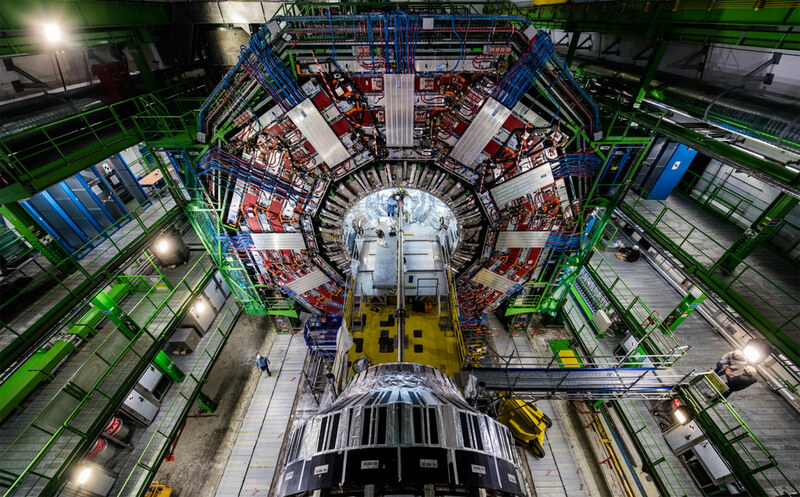 Those who connected were able to establish a first-class link with the scientific contents, as happened between a northern locality of Uruguay, the CERN and IceCube, where they could all talk directly with each other to discuss the latest scientific advances. In 2016 we invited Monica Bello to present the programme of artistic residences known as Arts at CERN, as part of the 3rd Online Congress on Education and New Media with 1,200 participants from Ibero-American universities. Bello shared the work methodology which generated dialogue between collaborating artists and scientists by exploring artistic languages and fundamental research to stimulate creations and discoveries. It was an inspiring message for those attending online, who at their respective academic posts were used to working in specific areas without daring to cross the frontiers between the different disciplines. Another interesting challenge was collaborating with TEDxCERN 2016. Here it was proposed that we provide the online event with a more global approach. For this reason we suggested the involvement of part of the Latin American region with simultaneous translation into Spanish. Openness has always marked the CERN’s outreach actions. With the agreement of Montevideo we coordinated various local and regional actors who became active participants. To open up new spaces in the dissemination of particle physics, we created the “Friends of the CERN Network in Latin America”, which was inaugurated by Rolf Landua, the CERN’s Director of Outreach. In 2017, there was another virtual visit for different regions of Latin America which saw massive attendance. These cultural synergies constitute an invitation to join in with other future activities, open to all those people with curiosity who want to know and imagine how the elementary particles of our planet and the Universe function. Subsequent to the announcement by the CERN regarding the Higgs boson, during 2014 the collider underwent a temporary shutdown for refactoring and adjustment. That year in-person visits to the CERN intensified, especially to the ATLAS Experiment or Collaboration, which 25 years following its initial creation in the laboratory, is the main particles detector. At the reception of the CERN Secretariat, I waited to begin my visit and descend to the ATLAS “cavern”. A young PhD student announced that he would be our guide. We set off in a group made up of German Physics students and the author: a non-scientific Uruguayan. We went outside, crossed the tram line that connects with Geneva and circuited around The Globe which has a permanent exhibition of the CERN’s main discoveries as we left behind the summer landscape of the Alps. Once inside the ATLAS Experiment, the guide gave us a basic grounding in particle physics and we viewed the controls room. He told us that all things that are made up of matter are made up of atoms, the atoms are formed by electrons that orbit around a nucleus, which is composed of subatomic particles called protons and neutrons, in turn formed by smaller particles known as quarks. To date there are six known types of quarks (up, down, top, bottom, strange and charm). Together with leptons (electrons, muons, tauons, neutrinos) and bosons (Higgs, photon, gluon, W, Z) they constitute the so-called fundamental particles of visible matter and are the smallest that have been identified so far. The space was already familiar to me thanks to two previous online visits, and now I was here in person. I had a strange sensation, a mix of what I already knew about the CERN with the nerves of being in situ. We donned our safety helmets and went down to the cavern. 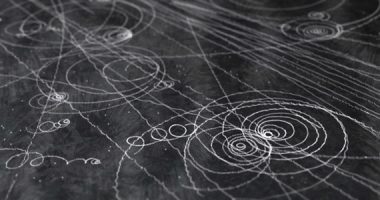 In the access corridors, there were posters about the inter-connected rings that make up the collider, circuits where the particles that collide and the detectors that receive them accelerate. The largest ring is called LHC which means Large Hadron Collider. It measures 27 Km in circumference. The construction of a larger ring measuring over 100 km in circumference is planned underneath Lake Geneva. When touring the enormous rooms that house the CERN servers, our voices dropped in volume. Adrenalin pumping, we continued along articulated corridors. A door opened and we reached the space where the detector is housed. A spontaneous silence fell over the group, substituted by the presence of this magnificent piece of technology. From a balcony, looking towards the centre of the detector, I could see its entire structure, probably the greatest concentration of cables in the world. I compared my height to the size of that cylindrical giant and estimated I would have to repeat my body height some 20 times, in reality 30 times. In a few seconds, my memory ran through the rings it had seen previously on the posters. Mentally, I travelled and returned to the same point: the balcony, looking at the detector. Overwhelmed, I thought about all the knowledge that had accumulated in order to produce and maintain that machinery. Upon our return from the ATLAS to the surface, our guide explained how the calibration of magnets worked so that you can make them collide exactly. We understood the transfer that the detector makes from analog to digital processes in order to be studied. He also mentioned a publication, in the journal Nature, which ponders the scientific culture of the CERN likening the abbreviation LHC to a Large Human Collision where people of different nationalities and cultures interact with a scientific object. I wanted to add another possibility for the initials LHC, such as Large Human Construction, as a part of the History of Science and Humanity. Once the visit was over, I did not expect to experience that mental and emotional satiety of having been there. One year later, in Montevideo, preparing a video-conference with artist Ignacio Iturria, he was mentioning situations that marked his perception. One memory was his visit to a zoo where an elephant was living locked up in its cage. This led something inside him to carry out artistic explorations in relation to scale. I immediately connected this example of the size of things and their perception, to my still vivid memory of the cavern. A kind of visual metaphor: “an elephant in a ring”, emulating the collision circuit and its detector. The visit to the cavern was an anthological aesthetic experience that was combined with the recursive enjoyment of having actually been there. This conceptual and emotional assimilation constitutes a multiple serendipity. Without doubt, the fortune experienced was a marked event worthy of being shared with others. 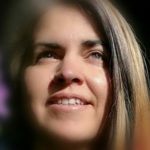 Director of the Anilla Cultural Latinoamérica-Europa in Uruguay, an advanced internet network of co-creation in arts, sciences, technology and society. Creator and founder of the Network of Friends of the CERN in Latin America and the Caribbean. 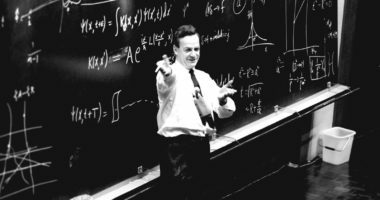 Rather than giving you a standard introduction to the modern formulation of particle physics, we are going to take a historical approach.